3 Watt LED Flashlight with Variable Focus Zoom Lens: Shown Illuminating Warehouse Isle In The Narrowest Beam (Left) And In It's Widest Beam (Right). 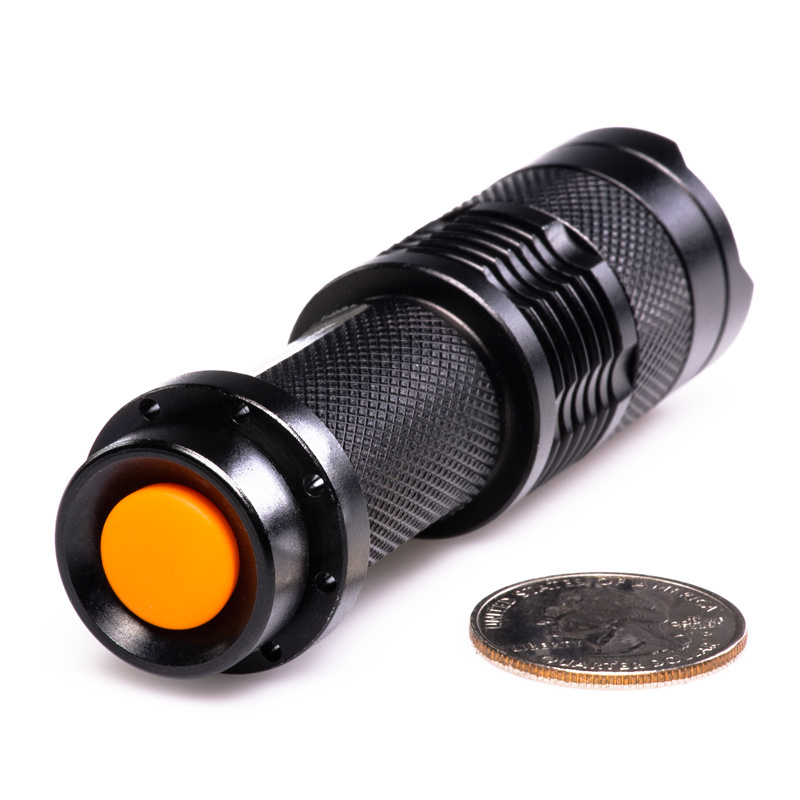 3 Watt LED Flashlight with Variable Focus Zoom Lens: Shown Illuminating City Sidewalk. 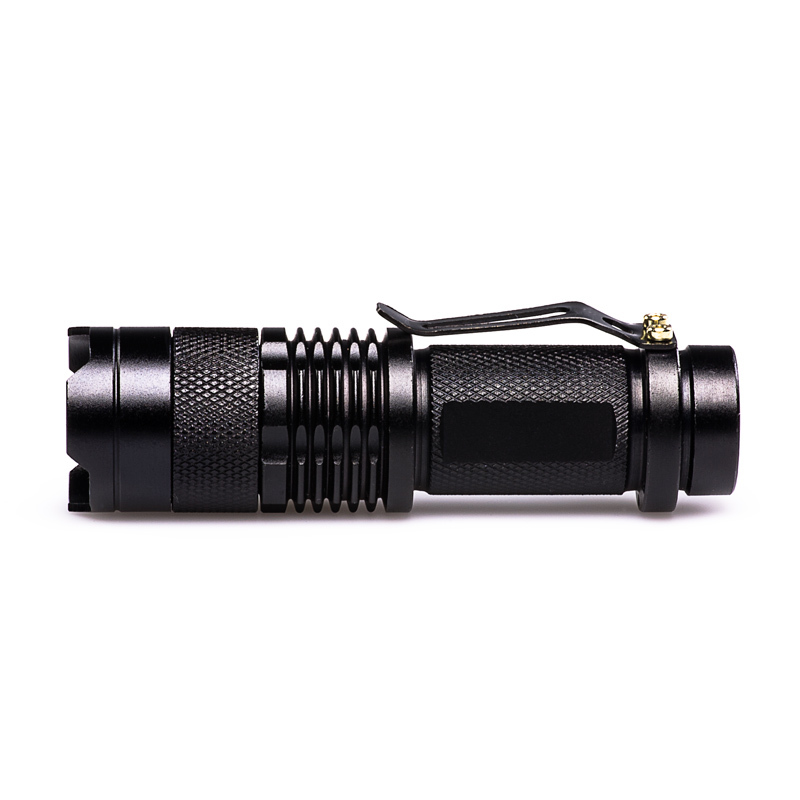 Handheld tactical flashlight with high power 3 Watt LED with adjustable focus zoom lens produces up to 180 lumens. 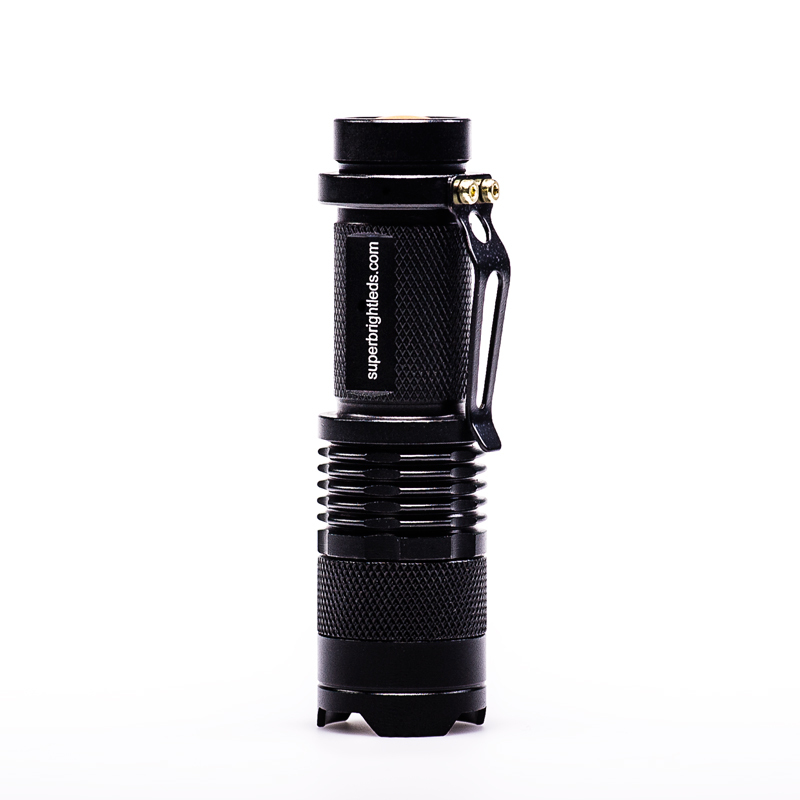 Knurled edge 6061T aluminium alloy body with attached pocket clip. On/off tail click switch, half click power button to switch between high, low, and strobe modes. Perfect for any outdoor activity including hunting, cycling, climbing, and camping. Uses one regular AA battery (not included). Totally amazing. 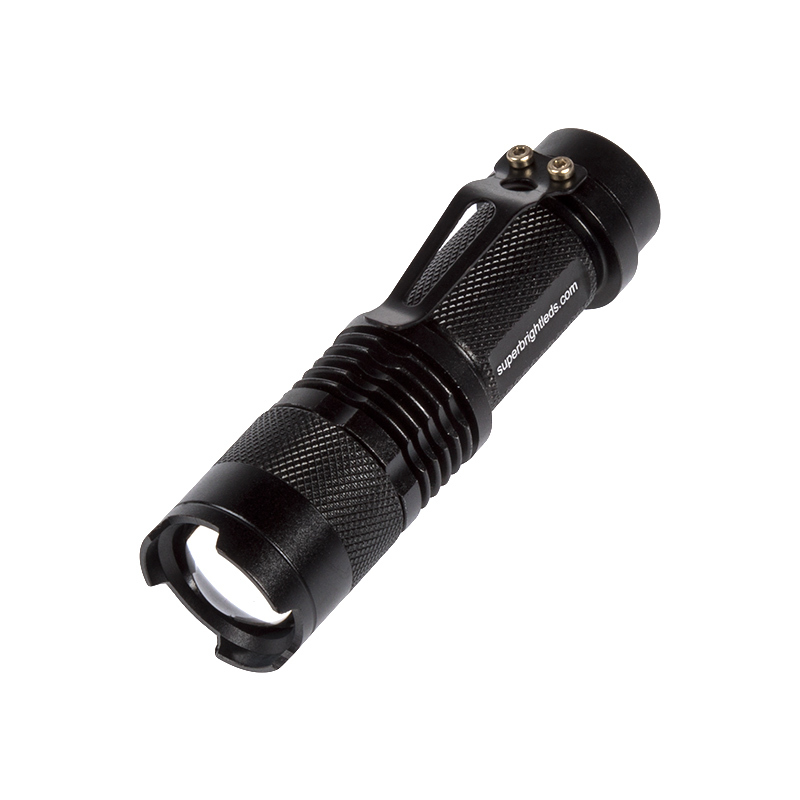 Very few flashlights have the adjustable beam and the ones that do cost over $100. I was so impressed I ordered 20 of them for my staff. Thanks SBLED's! This is a bright light for its size and only one AA battery. You can focus the heck out of it - as seen in the product pictures - and get some distance with it. Strobe is great. I do hate that when you turn it off it switches modes (high -> low -> strobe -> high .....). This is because switching modes is done with a light touch on the power button. Therefore, if I want the flashlight to turn on in high brightness mode, I have to put the flashlight on strobe mode before I turn it off. I wish a full press somehow didn't change the mode. But it's a great little light. I bought this light several months ago on sale. I now carry it with me everywhere. I really like getting so much light out of one AA battery. I'm a Wildland Firefighter and use a variety of lights in my work. This one is truly rugged. I've dropped it over a dozen times and the frame protects the lense really well. I've dropped it in a creek and pulled it out quick with no apparent leakage. The adjustable width of light beem really helps to get light out at some distance away from you. That's handy for searching for lost items in the forest at night. I love it! Wish I had bought more when they were on sale!! This flashlight works great. It is very bright and rugged for the outdoor environment. Highly recommended. The light came, I had to contact super bright leds because it came with no instructions and I needed to know what type of battery to use. They were very helpful and the light worked. It was not as bright as I expected but for the money it will be ok. I will give it some time and if needed I will give another review but vor now I will give A thumbs up.